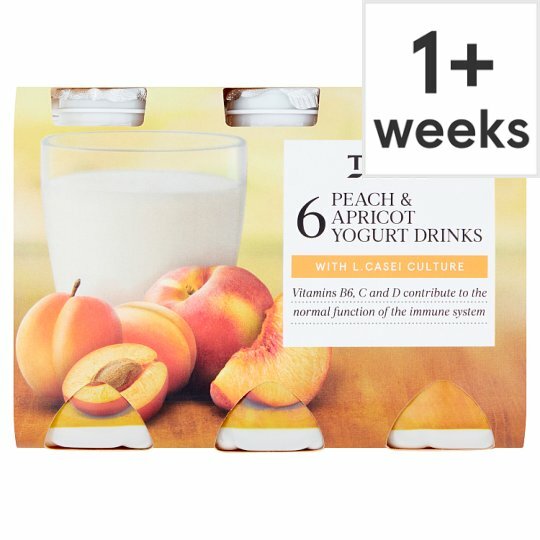 Peach and apricot yogurt drink with added calcium, L.casei, vitamins C, D and B6. INGREDIENTS: Skimmed Milk, Sugar, Cream (Milk), Apricot Juice (2.5%), Peach Juice (2.5%), Maize Starch, Milk Mineral Concentrate, Flavourings, Starter Culture, including L. Casei (Milk), Vitamin C, Thickener (Carob Gum), Milk Proteins, Colour (Beta-Carotene), Vitamin D, Vitamin B6. Keep refrigerated. Once opened, consume immediately and by 'use by' date shown.